Includes images of famous monuments and tourist attractions. This is a lovely c.1930 map of India by George Philip and Sons Ltd. The map extends from Kashmir south to include Ceylon or Sri Lank and includes modern day India, Pakistan and Bhutan or Myanmar. The entire nation in beautiful detail with relief shown by shading. The map also notes important cities, towns, rivers, hills, deserts and lakes. The railway network throughout the country is shown in red. Seventeen photographic illustrations of monuments and attractions surround the map. These include Golden Temple Amritsar; Jaipur; Kutab Minar, Delhi; Sarangapani Temple, Kumbaconam; Central Station, Madras; Siniolchu, Sikkim; Kailas Temple, Ellora; Simla; Bombay from Malabar Hill; Victoria Memorial, Calcutta; The Residency, Lucknow; East Gate, Sanchi; Darjeeling; Taj Mahal, Agra; The Ghats, Benares; Dhal Lake, Kashmir; and Mylapore Temple, Madras. Many of the monuments attract visitors to this day. 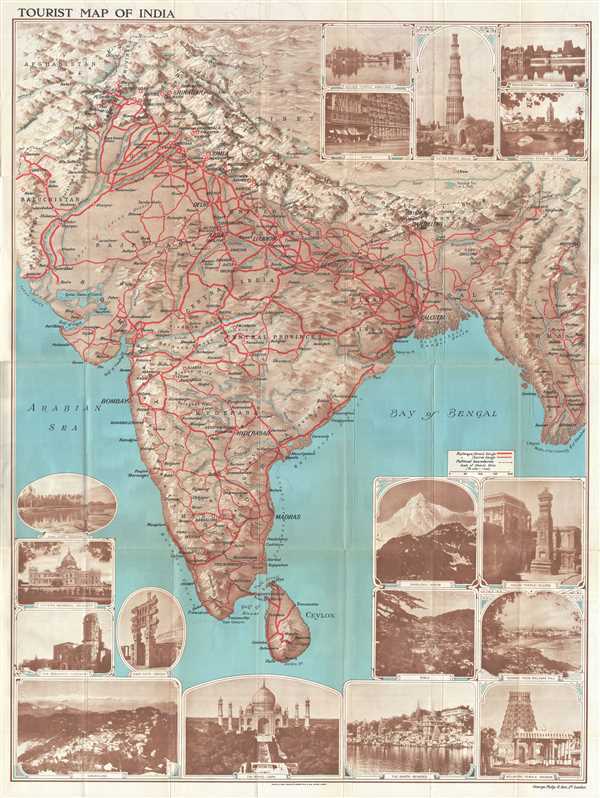 The map was published by George Philip and Sons Ltd., London for the Indian State Railways. George Philip (1800 - 1882) was a map publisher and cartographer active in the in the mid to late-19th century. Philip was born into a Calvinst family in Huntly, Aberdeenshire, Scotland. Around 1819 he apprenticed himself to William Grapel, a Liverpool printer and bookseller. Fifteen years later, in 1834, Philip founded his own Liverpool book and map firm. Philip's earliest cartographic ventures were mostly educational material issued in tandem with John Bartholomew Sr., August Petermann and William Hughes. In 1848 Philip admitted his son, George Philp Jr. (1823 - 1902) into the firm, redubbing it George Philip & Son Ltd. George Philip Jr. ran the firm until his death in 1902 by which time it had developed into a major publishing concern. His successors established the London Geographical Institute, a factory where they embraced modern printing techniques to produce thousands of economical and high quality maps. In April of 1988 George Philip & Son was acquired by Octopus Publishing, a branch of Reed International. Nonetheless, today the firm still trades and publishes as George Philip & Son. Very good. Some wear along original fold lines, with some rips near folds and intersections, repaired on verso. Folds into original paper binder.